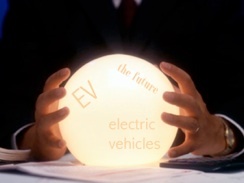 Electric Vehicles are the Future: Believe the Hype! This afternoon I read an article written by John R, for The Motley Fool, entitled, “Don’t Believe the Electric Car Hype.” After reading this title, I figured I’d be in for an EV-bashing ride of arguments as to why EVs (electric vehicles) will never be successful. The article wasn’t as bad as I expected. Instead, the writer, John R., takes the reader gently through his arguments while subtly praising electric vehicles along the way. His arguments though, are full of holes and I’ll reveal those in a bit. It’s unfortunate that he used such a strong and negative title for a technology with such a positive goal. To me, the title of his article screams “Electric cars are doomed!” However, in one portion of his article, he writes, “that doesn’t mean electric cars are doomed.” Perhaps then, he used that title just to get the attention of his readers. He begins his article by questioning, “Are electric cars the next big thing?” He goes on to argue that “hardly anyone has figured out how to make a profit on this category of vehicle.” He suggests too that government funding for the idea is a problem as well. He ends his article by praising hybrid vehicles and stating that “hybrids are the real future of cars” for the next 10 to 20 years. I find it so ironic that he sees hybrids as the future of cars for the next 20 years. Hybrids certainly will be part of the future mix of cars, but he sees Electric cars as part of a very small niche market, and I think he is dead wrong. In his reference to EVs, he says “They aren’t exactly selling like hotcakes.” His argument is that Nissan, has only sold 10,369 of their Nissan Leaf electric car in about a year and that’s the number of F-100 trucks that Ford sells in just a week. That’s not much of a dent in the whole automotive landscape. Well, guess what John, your future car, the hybrid, wasn’t exactly selling like hotcakes either when it was first introduced. When Toyota created the Prius, the first mass-produced hybrid in 1997, (per Wikipedia) it sold only 300 cars. It wasn’t until 4 years later, in the year 2000, when Toyota was able to sell almost 20,000 of them. Thus, it took Toyota 5 years to sell twice of what Nissan has sold in just 1 year, and thus what they may sell in 2 years! Even Tesla Motors has pre-sold almost 10,000 of its Model S EVs before it has even mass produced any; and these buyers have never even driven one! If that’s not a real EV demand, you tell me what is! If any of us were to apply John R’s logic in 1997, then the hybrid car is a “niche” concept that will never succeed. Oh, but wait, that’s right, it looks like they are succeeding---ok scratch that. Electric vehicles are selling better than hybrids when they were first introduced! If we extrapolate that even better initial success, it seems to me that EVs will ultimately have even better success than the hybrid. I suppose that if the writer, John R, had written this article just 15 years earlier, perhaps the title of his 1997 article would have been “Don’t Believe the Hybrid Car Hype”. Regarding his argument of how hardly anyone has figured out how to make a profit from an EV; someone needs to remind him that the first Prius, per analyst estimates, cost over $32k to make, and sold for about half of that--just a bit over $16k; a whopping 50% loss (source: Wikipedia)! Toyota, however claims that they broke even and didn't become profitable with its Prius hybrid until 2010! John R avoids getting into discussing the idea of government funding in electric vehicles, but says enough to imply that the idea is a bad one. Without government funding, so many of the innovations that have changed our world would not exist. Government funding in new technologies and ideas is a perfect example of how our tax dollars are hard at work in making our world and the quality of our lives exceedingly better. Here’s an example: In 1965, Bob Taylor had an idea regarding how computers could communicate with one another. The idea was explored by DARPA, the Defense Advanced Research Projects Agency who invested government funds in exploring its potential. That led to to the creation of ARPAnet which led to the very mechanism you are using to read this article, the internet. Oh, but wait, government funding is a bad idea--scratch that...but wait, then again, how then, are you reading this article? The US government funded GPS devices, DNA mapping and more. Even a couple of graduates from Stanford never would have succeeded in creating the worlds largest search engine without the funding and support from the National Science Foundation. Yes, I’m talking about a company called Google. Clearly without government support, much of what we enjoy today would have never existed, and I’m only scratching the surface. His next point is in reference to the range and price of electric vehicles. He makes a point of reminding his readers that you can find “gas stations on every corner.” He states that electric vehicles even with their limited range are expensive due to their high cost of batteries. What he fails to mention, however, is that the cost of batteries is offset by the low cost of fueling with electricity vs. gasoline; see Teslanomics. A Tesla Model S for example, has an expected total cost of ownership equal to some cars that are priced from $20k to $35k. Yes, a hybrid does offer an excellent alternative to a pure gasoline-fueled vehicle but driving via electric is still cheaper. In California, with gasoline at a price of $3.75 per gallon, driving costs 7.5 cents per mile in a hybrid, and 3.8 cents per mile in an EV. California too is a relatively expensive state for electricity costs. There are 41 states that are cheaper! For example, in Texas, Arizona, West Virginia, and Oregon, costs would range from 2.4 cents to 2.8 cents per mile, and the cost is as low as 1.6 cents per mile in Idaho! See the cost per mile for driving in your state. I don’t think that John R is really considering how expensive technology is when it first surfaces and how quickly it becomes cheap when it goes mainstream. 4 Years ago I bought a 37” LCD TV for $1700, and it was on sale! Based on that experience, if I apply John’s logic, I could say, large LCD TVs will never be affordable to the masses, and will be a “niche” product while people continue to enjoy the newer flat-faced tube (CRT) TVs. However, a 37” LCD TV today, goes for as low as $330. I even bought a 42” TV in November (on black friday) for $265! Samsung’s CEO estimates that their EV batteries will cost half of what they cost today by the year 2015. Consider what that will do the to the cost of EV range in the near future! Here’s a quote from a 1966 issue of Time Magazine that John’s Motley Fool article reminded me of, and in particular its title: “Remote shopping, while entirely feasible will flop - because women like to get out of the house, like to handle merchandise, like to be able to change their minds.” Sounds like online shopping was never going to work. Sorry Jeff Bezos, shut down that “niche” company, Amazon.com. You were wrong---NOT. Yes John, EVs have a range of 100, or 160, or 230, or 300 miles and you can’t recharge in minutes at every corner (yet), but that is certainly not a “daunting proposition” since anyone can recharge while they sleep in the comfort of their own home and wake up every morning with a full 100 to 300 miles of range, instead of the 1/8th of a tank that may take a Prius driver only 25 before having to fill up again. Yes, making a Tesla Model S have a 230 mile or 300 mile range is expensive now, but, that “limited” 100 (Nissan Leaf) or 160 miles (Tesla Model S) is not a problem when you consider that the majority of Americans travel 19 miles each way (38 miles round trip) in their daily commute. Many would welcome, no more waking up panicked because they are running late and forgot to “gas-up” last night. (A Hybrid vehicle, however, as a second family car will be handy for now for those longer rare trips). Technology changes and so will battery technology. Did someone say, “Floppy disk drive?” (Yes, I know...what’s a floppy disk drive?...ask your father...) Recent discoveries promise battery ranges that exceed 500, 1000 and even more miles per charge along with much faster charging times that we may see in the next 3 to 5 years (not 20 years). When given the option of waking up with a full charge of 500 or 1000 miles every morning, I think then, the EV will become the mainstream car embraced by all future Americans. But today, most Americans would do perfectly fine and would have an excess if they woke up with even 100 miles but feel better with the 160 miles of range that the Tesla Model S offers. By the way, just this year, Toyota is offering a new type of hybrid that borrows its idea from, guess what?--Yes, the EV! This year they have introduced the 2012 Prius Plug-in. They realized that in order to decrease the cost per mile, it would be a better idea to let the car run off of the battery first, and then run on gasoline when the battery runs out. Previous versions of the Prius use the battery only at low speeds and gasoline at higher speeds like highway driving. They saw too that charging the battery up by plugging it in, is a lot more cost-effective than charging it up with gasoline. It seem that Toyota realized that the concept of an EV is not so bad after all, and perhaps that’s why they’ve invested in Tesla Motors, and with no embarrassment whatsoever, boldly display “Powered by Tesla” on the dashboard of their own new electric vehicle, the new RAV4-EV that has its drive train manufactured by Tesla Motors. Finally, let’s talk about the environment. After all, driving a hybrid is not just about saving money; its also about reducing your carbon footprint; you know, polluting less. Yes, driving a hybrid will pollute less. Does that mean it’s ok to just add a little more cancer-causing pollution to what we’ve already produced? I suppose then it’s ok too to pollute our oceans as long as we only pollute half as much as were were before. My point is that in the long term, hybrid vehicles are not the solution. Another 20 years of just half as much pollutants is not a solution, it’s a band-aid fix at best. The solution is a zero-emission vehicle and its here now. Personally, I look forward to driving a zero-emission EV. John, I look forward too, to seeing you drive around in your EV in the not so distant future. Thanks for sharing your point of view. HAVE COMMENTS OR QUESTIONS? WE LOOK FORWARD TO HEARING FROM YOU.